There is a true, unspoiled beauty in Heritage. Cultural traditions passed down over generations; the skills that only come when taught with passion and heart; the wisdom inherited from the journey. These skills become the legacy, the embodiment of traditions from generations past. What is the Heritage Collection? 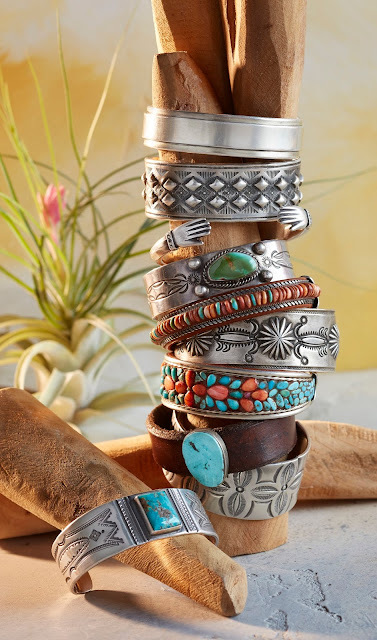 Rooted in the American West, we are drawn to Southwestern art and culture. There is a spirituality connecting the people and the craft to the land, forging a truly special meaning in each piece. These are core values we support and are honored to share, telling the rich history. For us, Heritage carries a special significance. It denotes an inspirational quality, emblematic of fine craftsmanship. Our Heritage Collection is uniquely curated to highlight and share jewelry meant to become centerpieces of an individual’s collection. Our Heritage Collection is comprised of pieces from two types of artists: original, one-of-a-kind pieces fashioned by artists from generations past, and new pieces crafted using the traditional methods. For many of the Southwestern cultures, the artisan skills were born out of cultural necessity and became traditions after being passed down. Early artists learned a trade out of necessity, but the skills developed became passions. A lot of these traditions are dwindling, and a concerted effort must be made in order to preserve and maintain these legacies. For us, it is important to value these artists and traditional techniques within this curated collection to ensure these skills are not lost. Handcrafted pieces of this quality are incredibly rare. We scour to curate and hand pick what we find are the most special, both in quality and in story. There is a true appreciation that comes when knowing the pieces are fashioned by artisans through a pure love of the craft. Each item is a work of art. We are proud to honor the voices in this Heritage Collection. Shop the full Heritage Collection here.